The Coalition®, the studio developing Gears of War 4, featuring a gritty, battle-weathered design to complement the recently announced Xbox One S Gears of War 4 Limited Edition 2TB Bundle and Xbox One Gears of War 4 Crimson Omen Limited Edition Wireless Controller*, to offer the fans a complete gaming set up that shows their Gears pride. This headset has been tested and approved by Microsoft, with additional compatibility for Windows. It has a 3.5mm (4 Pole) plug** and 2M PC extension cable and features studio-grade sound stage that lets you hear your opponent more accurately from further away, making it ideal for FPS and open environment gameplay. The in-line audio control makes it easy to adjust the volume and mute the microphone right from the cable. For the ultimate comfort, HyperX CloudX Revolver Gears of War features a genuine leather headband and high-quality, award-winning HyperX memory foam that lets you play for hours. Its solid steel frame is built for long-lasting durability, and the detachable noise-cancellation microphone results in clearer voice quality and reduced background noise for a better in-game chat experience. It’s certified by TeamSpeak™ and Discord, and compatible with Skype, Ventrilo, Mumble and RaidCall. 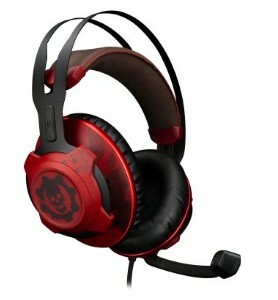 HyperX Cloud Revolver Gears of War is backed by a two-year warranty and legendary HyperX reliability.